Jessie Murphy (nee Habermann) couldn't have been prouder as she watched her husband of three years, Marc Murphy, return to the football field on Thursday. 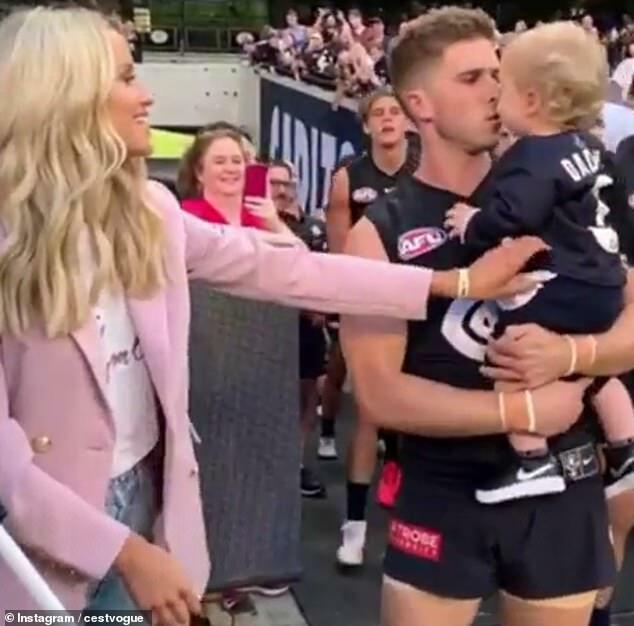 The 31-year-old Carlton FC star just played his 250th game, and his wife and their 14-month-old son, Max, were on hand to lend their support. Standing on the sidelines, Jessie shared a series of photos and videos from the game, which she branded a 'milestone' for her husband. 'A moment to treasure forever! Congratulations again to my husband @marcmurphy3 on such an incredible career milestone playing 250 games!' she wrote on Instagram. Jessie looked chic in pale blue jeans, a graphic white T-shirt and soft pink blazer as she watched the game. Meanwhile, Max looked adorable, matching his dad in a football jersey with Marc's squad number '3' and the word 'DADDY' emblazoned above it.